Is there a way to reverse myopia? Traditional ophthalmology doesn’t seem to think so, but in China, there is lore of eye exercises that, if done daily, will slow or even reverse myopia over time. My parents have always encouraged me to do them – three times a day, 2 to 3 minutes every time, if not to improve my eyes then to simply give me a quick break from work. I’ve compiled the guide to doing Yan Bao Jian Cao here. also go outside to look at far distances. Remember: no one else can improve your health but yourself. You are your own best doctor. It requires determination and persistence, and you may not show results in a week – or even a month – but positive results will happen after years. Yi Ching Eye exercises: It exercises the muscles, blood vessels, nerves and meridian by expanding and contracting the surrounding tissues. All of the exercises are done with eyes closed. Each step should be done 4x8 times. Keep your eyes closed. Then open them as much as you can. Relax and keep your hands on top of each other and put them on your belly button. Relax and look as far away as possible, with your back to the sun. 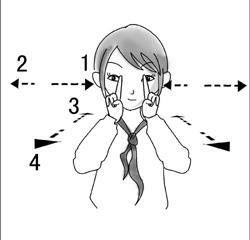 If you really don't have time, just close your eyes and rub your face until it's warm, and rub your hands until they’re hot, then put your hands on your eyes with the middle of your palms on the eyeballs.